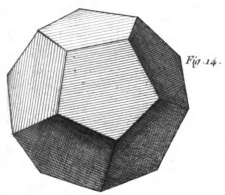 In the Atlas of Bergeron's Manuel du Tourneur, there are lots of dodecahedrons - 12 sided geometric shapes. They form the basis for many of the items. This one is from page XIX. I really like the star he shows in one of these, but I figured I'd better start with just the basic shape. I couldn't find any references on how to make one, so I learned as I went along. 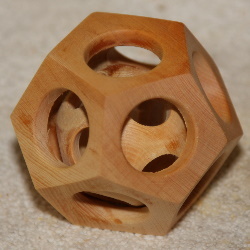 The dodecahedron I'm going to make includes a single sphere inside the 12-sided shape. The inside sphere is optional and I suggest making your first one without it. 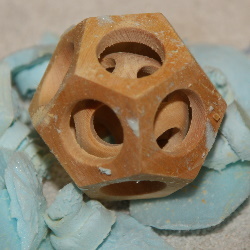 The photos below are made of a Huon Pine ball. Hemispherical chuck, flat tool rest, jacobs chuck, lathe, etc. The #3 crown cutter or any other hollowing tool that will cut a chase 3/4" to 7/8" radius. Ensure that your cutter is shaped correctly and sharp. You'll need 11 styrofoam pieces 1-1/2" round (I use squares) and at least 1/2" tall. 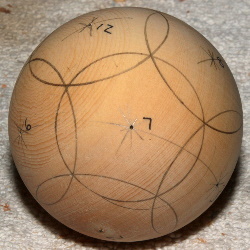 Square end scraper or any other tool to cut a flat on a sphere. 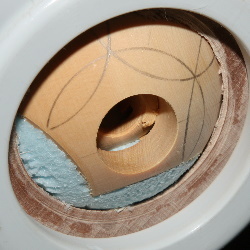 Optional for 1 inner ball: #2 crown cutter or equivalent. Optional for 1 inner ball: 1/2" forstner bit. 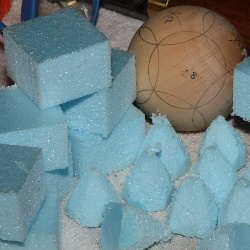 Optional for 1 inner ball: 11 styrofoam cones with 1" base (I cut 1" cubes on the bandsaw and shape them to a cone with a rasp). 1 You'll need a very round ball for this project. A wobbly ball won't work well. 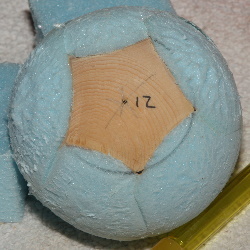 Start by determining and numbering the 12 primary points on the ball. Now you need to establish the size of the flat at each primary point. Pick 3 adjacent points and draw and arc with your compass to find where they intersect. It should be about a 3/4" radius. Once you get it exact, mark that circle around each of the 12 primary points. 2 Gather your marked 2-1/2" ball, styrofoam cubes and optional cones. 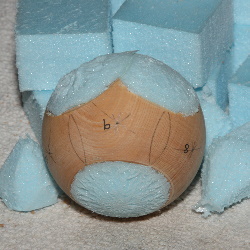 3 Chuck your ball at the first end grain point and drill a 3/4" hole to about 1-1/2" depth. 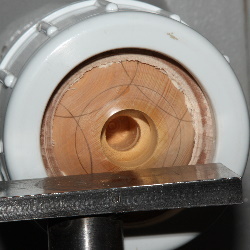 If including the inner sphere, drill the 3/4" bit 1/2" deep and then drill the 1/2" bit to a total depth of 1-1/2". 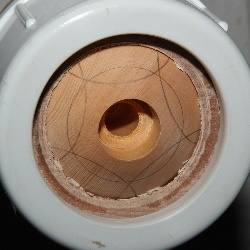 4 Make your hollowing cut with the #3 cutter. 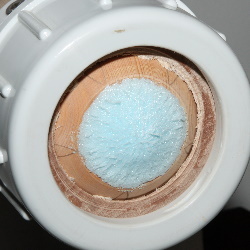 If including the inner sphere use the #2 cutter first, then the #3 cutter. 5 Use a square end scraper or other tool to cut flat into the sphere until the circle you marked is gone. Make sure the flat is 90' to the holes. 6 Smooth the flat with sandpaper as desired. This is your only opportunity to get this done easily. 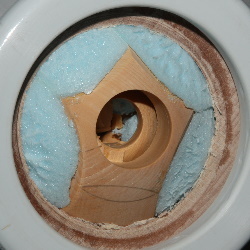 7 Optional - if including the inner sphere, insert the styrofoam cone firmly. Cut close to the flat with any tool that works. 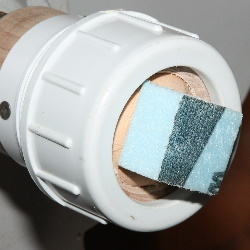 Use the finest grit sandpaper that you smoothed with and sand the styrofoam all the way flat. 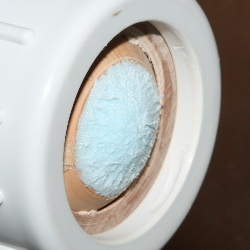 8 Attach non-permanent double-sided adhesive to the flats of the sphere. Center a styrofoam square on the flat and press firmly for several seconds. 9 Carefully cut the styrofoam to match the curvature of the sphere. Take light cuts to keep the styrofoam stuck to the sphere. I have a skew chisel that makes quick work of this. It's important to get the curve to match the ball as closely as possible. Use a template if you want. 10 Here's another view of the styrofoam. It's really important that you get this right. 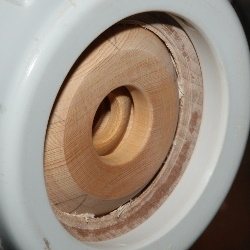 As you progress, there will be less and less wood for the chuck to grasp and for the cutter to guide against and more and more it will be guiding against the styrofoam. 11 Move the to next end grain point and repeat the process. Then continue with the other primary points. 12 Here we're over half way complete. 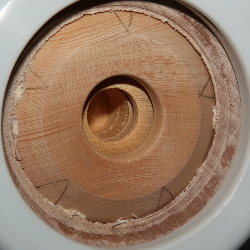 13 With only 2 holes left the cut, the inside of the sphere will be breaking up. Use tweezers or something else to reach in and pull out the pieces as you can. Be gentle though. 14 This image shows the last hole waiting to be cut. You'll notice that the flat is marked on the styrofoam. Before cutting hole 10, bring hole 12 to the front and mark the flat on the styrofoam with the sphere spinning in the chuck. That way after you cut hole 11, there will still be a flat marked to be cut on hole 12. 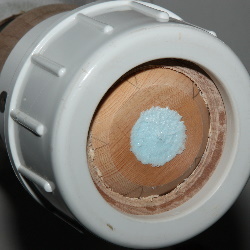 15 After cutting the chase(s) in hole 12, remove the sphere from the chuck and carefully pull off the styrofoam and remove any plugs. Clean up the double-sided adhesive with naptha. Your Dodecahedron is now complete! Finish as desired.